As the name implies, Highlands Ranch was once a large cattle ranching operation. And...it still has a cattle today! 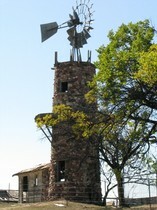 Drive south on Ranch Road and you will come to the original mansion, the adjacent cattle barn and the windmill which provided water for the livestock. If you are lucky, the cattle might just be grazing in this area when you are there. Highlands Ranch, Colorado is the culmination of years of extensive research and thoughtful planning. Here, you have everything you will need. From carefully designed streets and neighborhoods, to schools, financial services, shopping, medical facilities and more. Homes for sale in Highlands Ranch are available in just about all price ranges. Business properties are nearby and more are being developed so residents of Highlands Ranch can live close to their work. Highlands Ranch is located in the active and growing south Denver business corridor. Downtown Denver and Denver International Airport are just a short drive via convenient C-470, making Highlands Ranch the ideal place to live, work and play. Perhaps what's most unique about Highlands Ranch is the sense of community you find here in the neighborhoods that offer both intimacy and a sense of true belonging. Community-wide celebrations and special events help to make Highlands Ranch a place where people once again know their neighbors. It's a feeling that makes the quality of life here very special. In Highlands Ranch, your children are assured of excellent educational opportunities through the widely respected Douglas County School System. Highlands Ranch real estate offers you a world of special places. Among them are four extraordinary recreation centers - within easy walking or biking distance of your Highlands Ranch home. As a homeowner you and your family will enjoy an automatic membership. These neighborhood focal points offer you multi-dimensional sports, fitness and social facilities...activities and participation your entire family will enjoy.